Having a guest speaker in your classroom is probably better than when the tv on wheels rolled into your classroom. Starbucks corporation is an american coffee company and coffeehouse chain. Starbucks was founded in seattle, washington in 1971. As of 2017, the company operates 27,339 locations worldwide. Schmtt as arrange guest lecture on coffee as apart of extra curricullum activity to enhance students knowledge related to coffee and coffee outlet operation management. In this session guest lecture has given student emence knowdge about coffee and the overall operation system of the coffee shop. This session helped students to understand the coffee testing, production and overall manufacturing process. TOPIC- How to Open a Restaurant and the Licenses Required. Mr. Sachin gave information on how to open a Restaurant and the Licenses required for its operation. He spoke about the various types of restaurant currently in the market and how important it is for Market Survey. Ideally to open a Restaurant the Location or site is considered first , then the various source of finance available to open and operate the restaurant. The décor along with the furniture, Lighting, equipment required for the restaurant has to be in alignment with the theme of the restaurant. The size of the structure should be measured accurately in order to ideally locate all the equipments in proper place and also to place the tables and chairs to accommodate maximum number of seating for the guest to dine in. He spoke about the various records to be maintained like Purchase order, Requisition book, Invoices record and also the computer system which is ideal for restaurant operation which is Micros to get the daily sales record and number of each food and beverage items sold on the particular day. Mr Sachin then spoke about the licenses required to operate the restaurant like the Shops & Establishment Certificate, BMC Health license to serve food, Heavy Machine operating permission from BMC, permission to operate more than two cylinders of gas at a time from BMC etc. He gave a brief about staffing adequately and the necessary documents required like Provident Fund registration, ESIC certificate for hiring more than 10 staff, professional tax certificate for employees. Mr Sachin’s workshop was very informative. At the end of the session the students asked Mr Sachin many questions about a career in the hospitality Industry and to start own business. He answered all the questions with patience and told the students that to be successful in the industry they have to work hard and be enthusiastic about their careers. DEMONSTRATION OF FRENCH CUISINE BY AN INTERNATIONAL 5 STAR CHEF TO STUDENTS OF SURYADATTA COLLEGE OF HOSPITALITY MANAGEMENT, TRAVEL AND TOURISM. On 3rd September 2013 invited Chef Mohsin Mullani to demonstrate and teach the students of Suryadatta College of hospitality Management, Travel and Tourism the art of French Cuisine. Chef Mohsin has done his Post Graduation in Culinary Arts from UK he then joined the Marriott in London in the Food Production department. After two years he moved to Dubai and joined Fairmont Hotel and Resorts and from there he joined the Ritz Carlton Dubai. He is presently working with Emirates Airlines as a menu designer. The students were fortunate to have the opportunity to work along with a chef with such tremendous knowledge and experience. Chef Mohsin showed the students how to make a couple OF French starters, salads and entrees. He also showed them the art of presenting a dish and explained to them the importance of plate presentation. At the end of the session the students asked Chef Mohsin many questions about a career in the hospitality Industry and the food production department. He answered all the questions with patience and told the students that to be successful in the industry they have to work hard and be enthusiastic about their careers. To add value to the curriculum and give the students the best of academic inputs Suryadatta College Of Hospitality Management, Travel And Tourism regularly invites experts from the hospitality industry to share their knowledge and expertise. A bartending ,mixology and Flaring Demo was organized for the SCHMTT students on the 3rd September 2015 . The Guest Lecturers were Mr Pankaj Kamble and Mr Sachin Gowda who are Guinness World Record holders for flarology and have also represented India at other Global Challenges across the world. Mr Pankaj Kamble commenced the session by explaining the origins of the word ‘Bar’. He then briefed the students about how to set up a bar and showed them the various equipments, accessories, garnishes, etc. used to make Cocktails. The various methods used to make cocktails were demonstrated to the students by actually making the cocktails with substituted ingredients. An interesting cocktail was an award winning one called ‘eco tail’ served in a mud pot. Students were also shown the art of Flaring and mixing cocktails. The students were very excited to see the two Guinness World record holders perform the flaring act with bottles. He also gave information to the students on careers in bartending & Flaring and told them that bartending is a lucrative career for students of hospitality. FOOD PRODUCTION DEMONSTRATION BY A CHEF WITH INTERNATIONAL experience TO STUDENTS OF SURYADATTA COLLEGE OF HOSPITALITY MANAGEMENT, TRAVEL AND TOURISM. RELEVANT PRACTICAL EXPOSURE FOR STUDENTS OF SURYADATTA COLLEGE OF HOSPITALITY MANAGEMENT AND TRAVEL TOURISM. 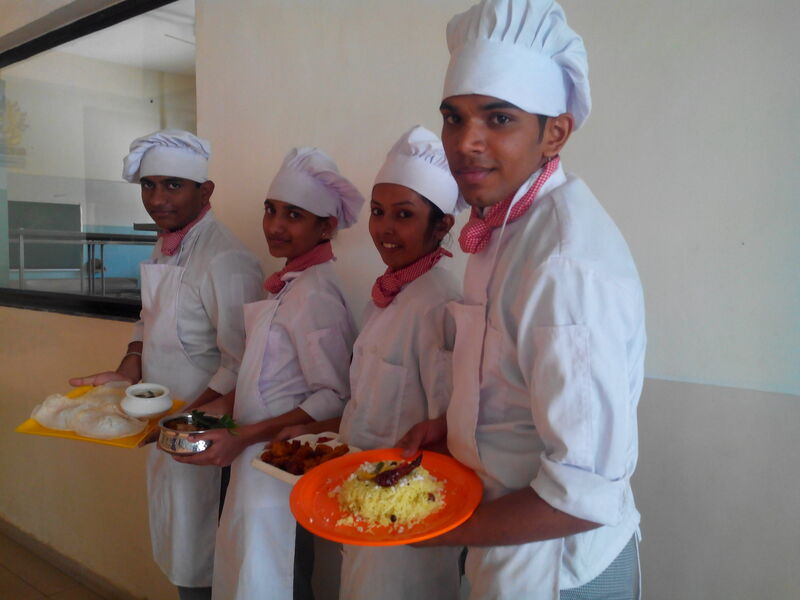 The Lokmat group organized the final round of the Maharashtra Masterchef competition for housewives at SURYADATTA COLLEGE OF HOSPITALITY MANAGEMENT AND TRAVEL TOURISM, Bavdhan, Pune on 28thAugust 2013. Lokmat chose SCHMTT as the venue for the competition because they found the infrastructure appropriate for conducting this competition. The well equipped and professionally designed traini ng kitchens and training restaurant, the spacious classrooms and the auditorium which can seat more than 750 guests were just right for the day long function. The students and faculty of SCHMTT were actively involved in co-ordinating and synchronizing the various activities and thus contributed to the success of the competition. The three judges – Celebrity chefs Mr Saransh of Food Food Channel, Mr Devvrat Jategaonkar and Ms Shobha Indani. 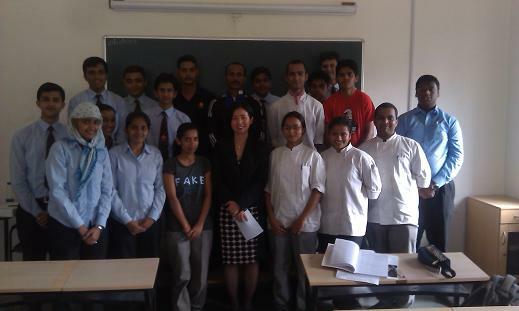 The students were fortunate to get the opportunity to see the culinary talent of Maharashtra under one roof. They learnt many new dishes and also several food presentation ideas. Mrs. Sushma Chordiya, Secretory Suryadatta Education Foundation, demonstrated the Art of Rajasthani Cuisine to B.Sc. Hospitality Study Batch. It was an informative learning experience for the students. Students were also shown some common and easy flower arrangements like fan shape, ikebana, free style, etc. She also gave information to the students on careers as a florist. Workshops such as these help the students learn what they have learnt in the theory classes . A demonstration of Gueridon Service was conducted by Mr Satish Dargan for the 3rd Year B. Sc – Hospitality Studies students on 11th October 2012. Mr Satish Dargan is an alumni of the Bharti Vidyapeeth College of Hotel Management, Pune. He has nearly 10 years of experience both in the Industry as well as academics. He started his career with the Mayfair Banquets and at present he is the Executive Chef at the 10th Mile Restaurant in Manjiri. He is also a Consultant for those who wish to open new Hospitality Projects. As Gueridon Service is done in full view of the guests from a trolley Mr Dargan demonstrated the skill and the do’s and don’ts to be followed while carrying out Gueridon Service. He demonstrated the making of salads. He also showed the students how dishes like Crepes Suzette were flambed. He explained and demonstrated the making of Speciality Coffees such as Café Royale and the eye appeal of fambeing the coffee. The students were explained the importance of practicing the art of gueridon service and flambéing so as to attract the guests and thus increase the restaurant business. A workshop on the art of Bartending was organized for the students on Saturday 11th August 2012. The workshop was conducted by ‘The Flaming Trio’ from Mumbai – An organization which specializes in Bartending. They are have represented India in numerous Bartending Competitions and have won many International and national awards. The aim of the workshop was to introduce the students to Bartending as a lucrative career option. In recent years bartending has become a show business . A good batender is like a good Chef – he is able to invent new cocktails and also present them in a manner that is attractive and appealing to the customer . He should therefore be an expert in Mixology – the art of mixing different alcoholic and non alcoholic drinks to make a flavorsome and delicious cocktail and Flair bartending which is the practice of bartenders entertaining guests, clientele or audiences with the manipulation of bar tools (e.g. cocktail shakers) and liquor bottles in tricky, dazzling ways.. Recently, there is a noticeable rise in bartenders combining prominent mixology knowledge and flair bartending to enhance the guests’ overall experience and thus increase profitability. The Flaming Trio gave the students an introduction regarding mixed drinks and cocktails. They then showed the students how to make various cocktails – classical as well as contemporary, using the art of mixology and flair bartending. The students were fascinated when the Flaming Trio displayed Flair Bartending with flaming bottles. The workshop was a great success and now many students are looking forward to adding Bartending to their qualifications. 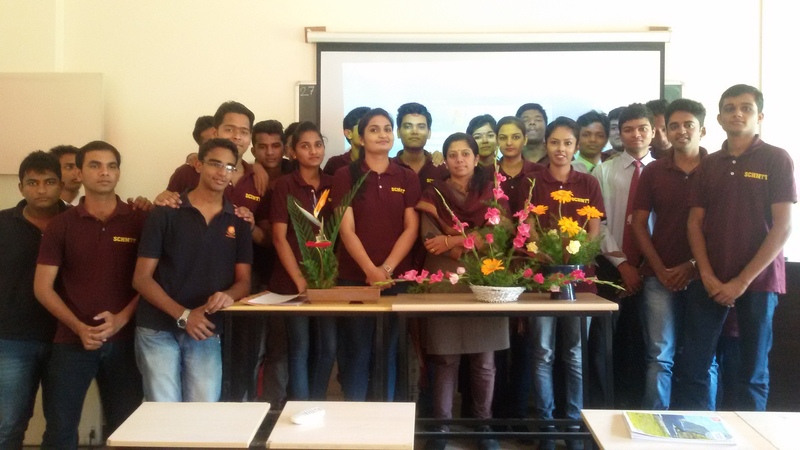 A workshop on ‘ How to make Different types of flower arrangements’ was held at Suryadatta College of Hospitality Management & Travel Tourism on 13th October 2012. It was conducted by Ms Saroj Joshi from “Pushpmayee Floral Arts” . She has 10 years of experience in conducting Flower arrangement Classes and she also takes orders for flower decorations. In addition to the demonstration Ms Joshi also explained the principles and basic rules for making flower arrangements. She demonstrated different styles of “Ikebana” – the Japanese art of flower arrangement as well as the Western style. Ms Saroj Joshi also explained the different rules to be followed while making Symmetrical, Asymmetrical, Fan Shape, Half Moon, S Shape, Crescent etc. She also emphasized on the usage of the right tools, equipments & foliage to make a flower arrangement which looks like an expression of art. 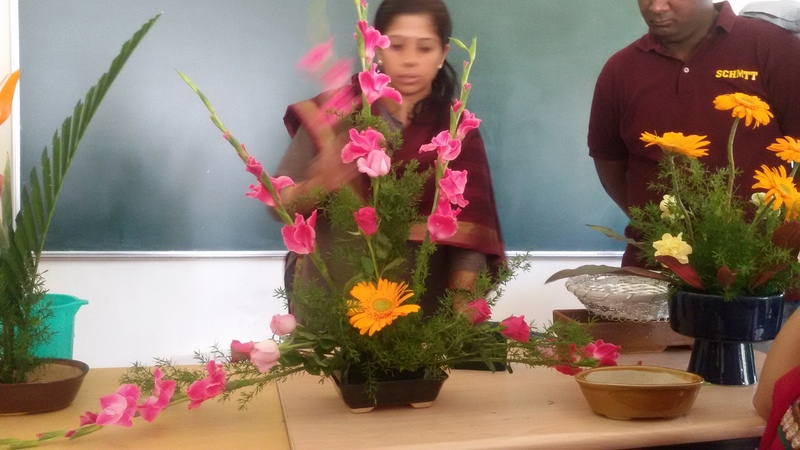 At the end of the session students were able to see how creatively flowers can be arranged and the skill and knowledge which is required to make a flower arrangement beautiful and appealing to the eye. Ms Sue Young, Placement Manager of Global Education Management Ltd, UK, guided Hospitality Managment Students about internship opportunities in UK.